Creating a Gifted Individualized Education Plan is hard work. It is a formal plan that delineates the accommodations a student will have in place for an academic year. Even if your locality does not recognize GIEPs or IEPs, they can be useful as a framework to advocate for a gifted student. GIEPs need to be prepared and submitted well in advance of the year in which they are expected to be implemented. They should be detailed and specific to ensure academic progress and talent development. Gifted IEPs are a good idea for gifted students because a written and agreed to plan is easier to implement and monitor over the course of the school year. When written with specific goals and appropriate terminology, they have a greater success rate than verbal agreements. Beyond academic objectives, Gifted IEPs can address a child’s social adjustment with peers and learning preferences. Parents, gifted education teachers, regular education teachers, guidance counselors, and school psychologists can all be involved in the GIEP process. The student should be consulted throughout the process as well. If the gifted student does not ‘buy in’ to the final agreement, the chances of success are slim. Often schools form multidisciplinary teams to review education plans. What should be included in a GIEP? An excellent example can be found here. Assessment and testing data will usually be presented in the GIEP. Present Levels of Educational Performance (PLEP) provide a baseline to aid in showing annual growth of a student. Specific goals and expected outcomes related to the student’s strengths and interests; specifically designed instruction to be provided; and support services like transportation needs, teaching strategies, collaborative time for gifted and regular education teachers should be included. Areas of weakness (academic, social, emotional, motivational) to be remediated may also be considered. Resources for completing a comprehensive Gifted Individualized Education Plan may be found in the links provided at the end of this post. A full transcript can be found on our Storify page. Thanks to Leslie Graves, Jerry Blumengarten, Jen Merrill, Amy Harrington, Jeremy Bond and Rhonda Boyer for additional links included below. Global #gtchat Powered by the Texas Association for the Gifted and Talented is a weekly chat on Twitter. Join us Fridays at 7/6 C & 4 PT in the U.S., Midnight in the UK and Saturdays 11 AM NZST/9 AM AEST to discuss current topics in the gifted community and meet experts in the field. Transcripts of our weekly chats can be found at Storify. Our Facebook Page provides information on the chat and news & information regarding the gifted community. Also, checkout our new Pinterest Page and Playlist on YouTube. Wrightslaw How Can I Fight for a Gifted Child? 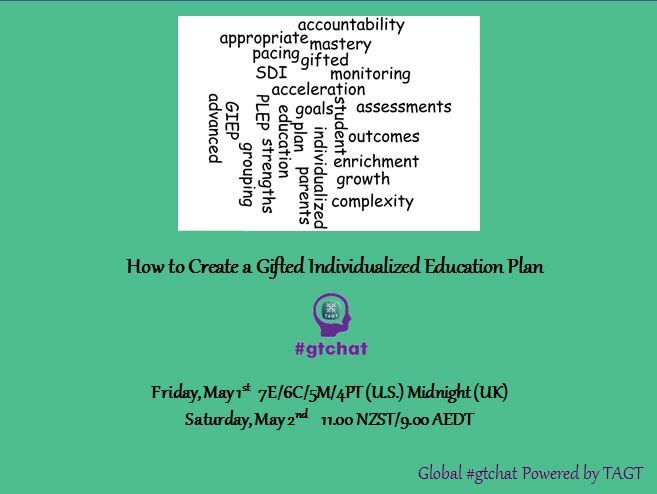 Posted on May 6, 2015, in Acceleration, Advocacy, Education, gifted, gifted and talented, gifted education, Identification, parenting, testing and tagged accommodations, accountability, AYP, education, enrichment, expected outcomes, GIEP, goal setting, goals, growth, gtchat, IEP, Individualized education plan, PLEP, social emotional, special education, specifically designed instruction, TAGT, Twitter. Bookmark the permalink. 2 Comments. Oh my! Thank you … this is just a big help when flying solo with no policies, procedures etc to guide regarding this kind of writing.